Famished after working out at the gym, Mr. Kiwi & I decided to march up to the 5th level @Plaza Senayan to check out Marché (no pun intended). A lady dressed as milkmaid welcomed and handed each of us a blank card to record our orders. *This reminds me of the concept at Food Kulture (which is now re-invented as Urban Kitchen) in Plaza Indonesia, that used digitized plastic cards to electronically record our purchases at the different stalls. Ms. Milkmaid warned that if the cards were lost, a fine of IDR 1.000.000 per card will be charged. I was almost appalled, not only by the ridiculous fine, but also by the way she spoke, which sounded comical, if not hilarious. Upon entering, the first station to greet us was the dessert! FATAL position! It's fatal because I'm supposed to pick the main course, but the delectable & pretty looking things attracted me like opposite sides of magnets! Lucky Mr. Kiwi was immune against the sweet-charmers, he valiantly tore me away, towards the core stations. LMAO! Being inside the Swiss "market" felt like nowhere else in Jakarta. The laidback atmosphere was a successful result of Marché's clever play with the rustic-themed furniture and warm lighting. The presence of a mini playground on-site clearly distinguishes Marché as a family restaurant. So, to avoid the little tykes' noise, Mr. Kiwi chose a table near the exit with side partition that separates Marché's little neverland from the curious passersby outside. Check out photos of the place here. So, we browsed the menu at the various stations like the Crêperie, salad, pizza, pasta, Rôtisserie (it's French, which basically means anything roast), Sausage, Rösti (it's potato pancake, Swiss-style), cold beverages as well as coffee & tea. It was quite tough for me to decide, as all of them looked appetizing, but we finally settled with 3 items. 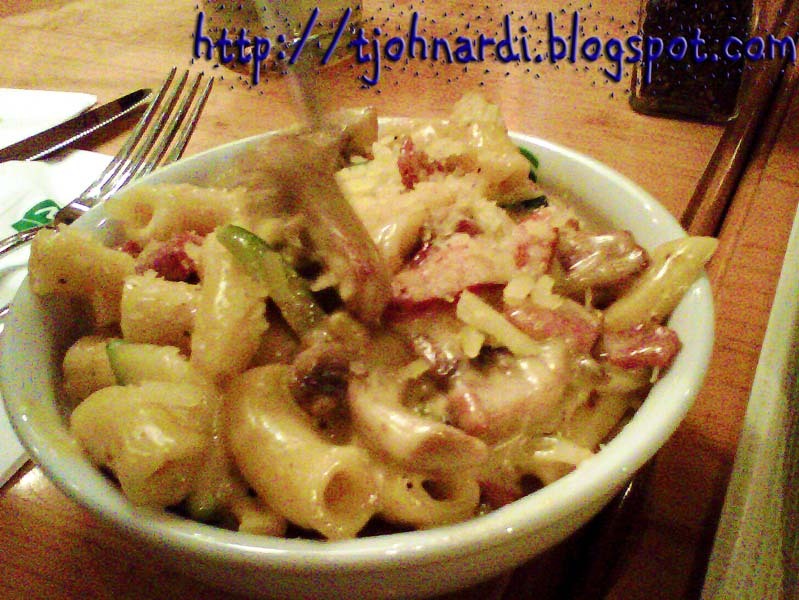 It's macaroni instead of spaghetti! The next one was probably the best galette I've ever had in my life (sorry Kitchenette, but your savoury galette is still no match to this one when it comes to satiating hungry-me haha). On Mr. Kiwi's recommendation, I picked roast chicken and cheese for the topping (or rather, the filling). 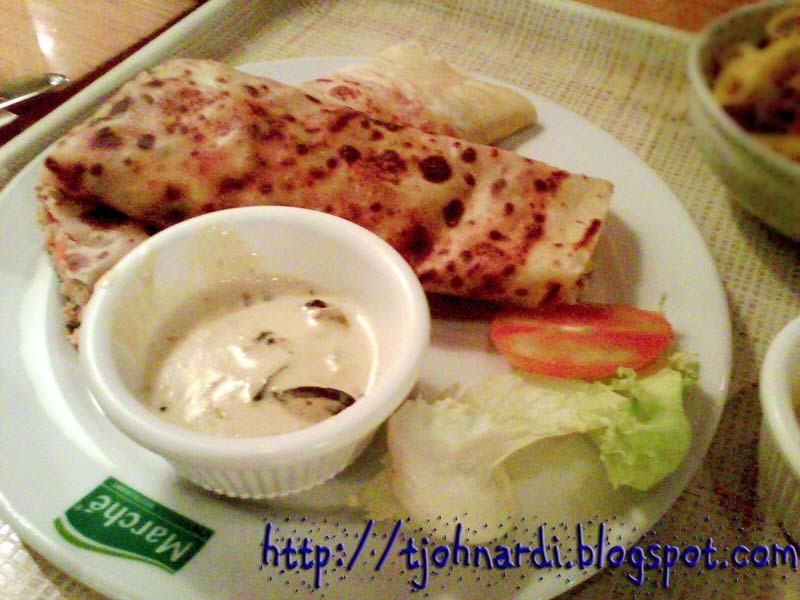 The galette came with mushroom sauce, what a perfect combo! I ain't sayin no more, this tastes finger-lickin good! 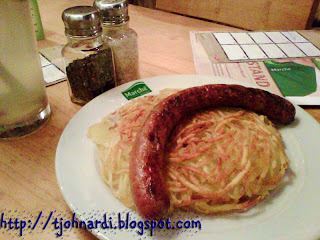 Here comes the Rösti with Beef Sausage! Curious about this unusual delicacy, I helped myself rightaway (sorry Mr. Kiwi, hungry gal's gotta eat...chomp chomp). Each pieces of the grated potato, which made up the entire Rösti, were perfectly crispy, yet soft enough to chew. And the buttery smell...hmm! Addicted to the first bite, I cut a second slice and dipped it into the sour cream that came with this dish. C'est magnifique! 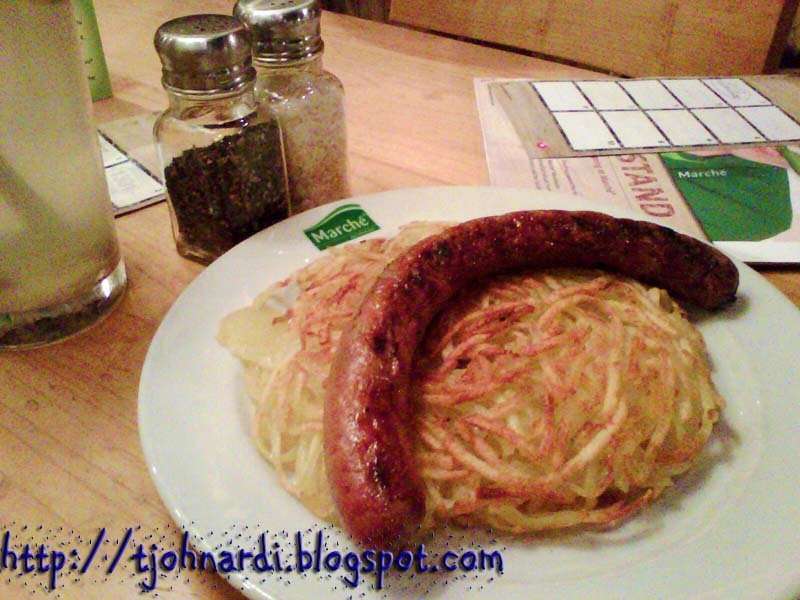 The beef sausage complemented the Rösti well. I ordered Rose Tea while Mr. Kiwi picked the home-made Calamansi & Sour Plum Squash. For all the teas, you can ask for free refill of hot water and there's a self-service syrup-counter right there. Despite the temptation to try the uniquely flavoured syrups (there were mint syrup, lemongrass, etc) I dutifully chose honey, as it's the safest to go with my Rose Tea. Oh, such a shame that I was too full, to even take a walk back to dessert counter *wails But the Rose Tea with Honey was enough to make a happy ending for our European feast. I must thank Marché for providing us food lovers with such delicious & authentic Swiss cuisine, a well-deserved 4.5 rating out of 5! Très bien Marché!